Ko Olina is an ideal vacation destination on Oahu's sunny western shore with pristine beaches lined with powdery white sands. This area's excellent golf courses and ocean activities as well as great dining and shopping provide everything you need for an idyllic Hawaii vacation. Enjoy the beach park at Ko Olina for a relaxing morning. Golfers will appreciate the Ko Olina Golf Course with its ocean views, waterfalls, rolling hills and impeccably manicured, multi-tiered greens. Enjoy great sunset views from the western tip of the island. 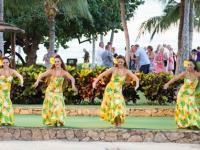 You will often find live music at the Marriott Ko Olina. Drive over to Waikiki to experience the iconic beach there as well as fun shopping, dining and entertainment. Downtown Honolulu has more great areas to explore including historic buildings and the eclectic shops of Chinatown. Visit Pearl Harbor to view the USS Memorial, and in downtown Honolulu you will find many historic buildings including the impressive Iolani Palace. Ko Olina Beach Park is located within the Ko Olina Resort area near high-end vacation properties and the Ko Olina Marina. The park includes one of the four man-made lagoons providing a protected swimming area lined with white sand and a grass lawn. These crescent-shaped beach coves known as the Ko Olina lagoons are protected by seawalls providing nice swimming areas for children with calm, shallow water and powdery white sand imported from the island of Lanai. Roy's Restaurant at the Ko Olina Golf Club is run by master Hawaiian chef Roy Yamaguchi who is one of the founders of Hawaii Regional Cuisine focusing on fresh local seafood and produce. Enjoy Roy's amazing creations while taking in scenic views of the golf course. You will find several restaurants at the Marriott Ko Olina hotel as well as the nearby Disney Aulani Resort. The Marriott's Naupaka Terrace offers poolside outdoor seating with ocean views and often featuring live music. More exceptional dining can be found nearby in Kapolei as well as an abundance of great restaurants in Waikiki and downtown Honolulu. Seaside sunset dining in Waikiki listening to live music provides a memorable evening. Resort gift shops and some local grocery and convenience stores can be found in the Ko Olina area. Nearby in the town of Kapolei are many shops to explore. Head over to the Ala Moana Shopping Center, Hawaii's largest, for an abundance of shopping opportunities. Fun shopping can also be found along Kalakaua and Kuhio Avenues in Waikiki offering everything from unique Hawaiian souvenirs to high-end fashion. Downtown Honolulu has many interesting shops including an assortment of unique merchants in the Chinatown district. Renting a car is recommended when staying in Ko Olina so you have easy access to nearby beaches and attractions in Waikiki and downtown Honolulu as well as day trips to the north and windward shores. Most major populated areas of Oahu can also be reached on the public transit system known as "TheBus." Ko Olina weather ranges from about 70 to 87 degrees F. throughout the year with rain and wind conditions varying in different areas throughout the Island. The south and west shores are generally a bit dryer and warmer than the north and eastern shores, and the winter months typically see more rain than summer though the south shore sees very little rain. Sunny skies, mild temperatures and warm trade winds make Ko Olina an excellent vacation destination all through the year. Rain showers are typically brief and light with ample sunshine even on the rainier days. Hawaii's predominant trade winds blow from the northeast bringing moisture-laden clouds that typically rain onto the mountains of the east and north shores creating green and lush landscapes.Trade winds are almost always calmest in the mornings so it's a good time to visit the beach. Ocean conditions vary each day though typically the north shore will have the calmest waters during the summer months and the south shore will have the calmest waters during the winter. Some beaches provide more protection from the open ocean, and if the waves are too big at the beach you visit then you may be able to find a more sheltered beach where water activities are safe. For swimming and ocean activities visit Oahu's lifeguarded beaches, obey all posted warnings and ask about the conditions on that day for the activities you choose. Ko Olina vacation homes provide the optimal way to enjoy your Hawaii vacation with all the luxuries of resort living and all the comforts of home. Browse through our Ko Olina vacation rental listings to get an understanding of the different amenities and property features we offer. 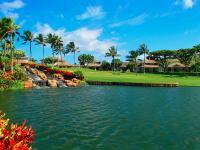 Our goal is to provide you with a with an unforgettable Ko Olina accommodation for your dream Hawaii vacation. We take pride in having the largest selection of high-quality vacation rentals on Oahu and we stand behind our product, making sure only the best of the best Ko Olina properties are listed on our site. If you have questions about our Ko Olina rentals or which Oahu destination is best for your vacation needs, please give us a call and we will be happy to assist you. King Kamehameha I and his wife Kaahumanu were frequent visitors to the Ko Olina region to fish and swim in the protected coves. Also known to enjoy the area was Queen Liliuokalani. The area that is today Ko Olina Resort was used as an army and navy recreational retreat during World War II. Resort development began in the 1980s and the area continues to be developed as a high-end vacation destination. Oahu's south shore has a rich history from the day's of Hawaiian royalty through the eras of missionaries, whaling and sugarcane. Learn more about Oahu's history on the self-guided Waikiki Historical Trail beginning at the Royal Hawaiian Center in Waikiki and marked with bronze surfboards that have plaques providing information about the historic sites.